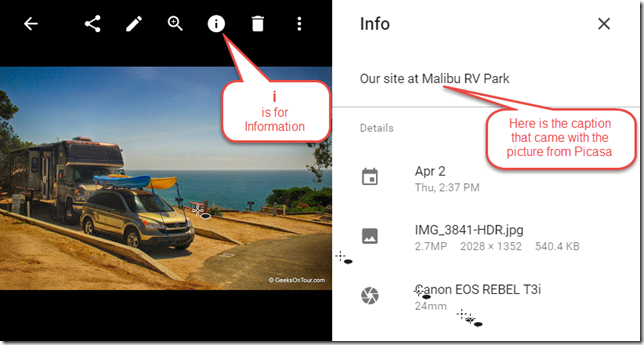 Photo Captions using Google Photos vs. Picasa – Learn Picasa and Google Photos! Picasa has many features that Google Photos does not. The most important feature, for me, is captions. 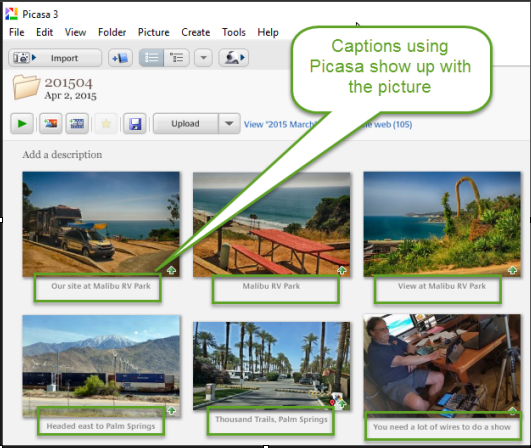 Picasa can add captions to your photos that are stored with the picture file itself and can be viewed by other software. I love captions. At a glance, I can see which photos I’ve identified as the best because I only add captions to my best. I also see, at a glance what the picture is about – SO important for aging memories! Even more for aging pictures! 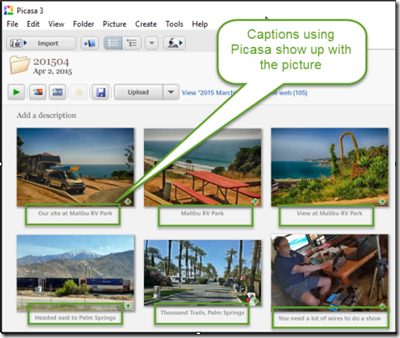 If you are a Geeks on Tour premium member, you can watch this video about using Captions in Picasa: Add Captions to your Photos #154 If you don’t see captions below your pictures in Picasa, turn them on with the following command: View->Thumbnail Caption->Caption. Remember that Picasa is viewing pictures on my computer. All of these pictures in the screenshot above are on my computer and the captions are stored in the metadata of the .jpg picture itself. So, if you use any method to transfer this picture to somewhere else, the caption goes with it. Whether or not the recipient will see that caption depends on what software they are using to view it, but I guarantee that the caption is encapsulated in the picture file. For example, if you use Picasa’s tool to “Upload to Google Photos,” the caption does go with it, but it doesn’t show up easily. It is available for searching in Google Photos. To see the text associated with a photo in Google Photos, you need to click the i-for Information. If you are using Google Photos, then this text is referred to as “Description.” For any photo in Google Photos, you can click the I for Info and you will see a field for “Description.” Type whatever you want in there and that description will stick with the picture as long as you are using Google Photos, but, if you download that picture to your computer – the description is lost. Google Photo’s Description text is stored in some kind of database associated with Google Photos rather than in the metadata of the picture itself. Please add true captions to photos. The current “description” is lost when I download the photo to my computer. It needs to be written to the metadata of the .jpg file. I would also like captions to appear under the photos in library or slideshow view. Next comes a step where you can add a screenshot to your feedback. However, in this case, you cannot see the Info part of the screen while you’re in the Feedback tool, so this step will make no sense. It will capture whatever is on your screen and send it in with your feedback. You can use the option to blackout any personal information if necessary. I could not get an appropriate screenshot, because you can’t click on a picture and go into i for Information while using Feedback. Get everyone you know to do the same! And maybe we’ll see a caption update someday soon. If you’ve been using Picasa for a few years, you remember the online sharing feature called Picasa Web Albums. When Picasa first started uploading pictures to the web – into your Google account – it used this interface called Picasa Web Albums. That interface is still there. It accesses the same set of photos that you see with Google Photos, but it uses different (older) programming – and, therefore has different features. One thing it has is visible captions. If you use Google Photos and the Description field to type some text on all the pictures in an album, for example, you can view a slideshow of that album using Picasa Web Albums (www.picasaweb.google.com) and you will see the Descriptions show up as an overlay at the bottom of the pictures. Nice! But, if you then download any of those photos – you still lose the Description – so, this is only solves half the problem. Having Captions or Descriptions or Titles that stay with the picture is my primary need. I agree that maintaining comments/description would be very helpful. I’m very hesitant to add caption to my photos for this exact reason. Who knows if they will stick around? I’d like to tag each photo with comments, but until I’m sure, I won’t. I’m sure Google won’t care about this, but I think it would also be fantastic to get cross-support for comments/descriptions with Blogger captions. It’d be great if I could add caption in Google Photos en-masse, then when I insert the photo into a Blogger post, it pre-populates the Blogger image caption. That would be ideal. Anyway, I copy/pasted your feedback suggestion. Let’s hope it works out. Photos does seem to the be the product getting the most love nowadays. I have sent the feedback as you suggest. My wife is a photographer (MFA Photography) and uses her own website to show photos with captions using WordPress. Unfortunately there is no easy way to incorporate the captions from Picasa into a WordPress photo that we have found, yet. She just enters them as she goes. Of course there are far fewer images represented than the 1000’s we take as we travel. Agreed. Not only in WordPress, but even in Blogger – Google’s own blogging platform – there is no way to show the caption that has already been entered using Picasa. You must enter it again. I’ve been waiting for 10 years for that to change! Doesn’t seem like it should be that hard to do. So … I’m not holding my breath for any of this. Right now, I still download my best photos from Google Photos to Picasa, enter the captions there, and re-upload to a shared album. P.S. The thing I really appreciate with your tips is that you add pictures to help us learn what you’re explaining. I’m a very visual person, so this is really important for me. I thought I sent this suggestion to you couple of months ago re to the captions. Perhaps I didn’t, doesn’t matter. This article is very well written – thank you for pointing this out. We’ll see how much google feedback is taken into consideration – they’ve been encouraging giving feedback to google for months about the captions. I have my doubts. I sent my feedback – the lack of captions is causing me to look for other photo display options – I’m considering a subscription product like SmugMug. Also looking at Flickr. SmugMug and Flickr are good products – and I see that they both have smartphone Apps as well. BUT, Google is what I really know. As long as I have a workaround for anything I need to do – I’d rather stick with Google. My bet is that there will be other ‘gotchas’ if you start using something else. Right now, for captions, I download my best pictures to my computer – use Picasa to add the captions – and re-upload to shared albums. It uploads at the smaller size (2048 pixels) but, that’s fine for my shared photos. You noted: My bet is that there will be other ‘gotchas’ if you start using something else. You are probably correct about the “gotchas” with other products – there is no perfect photo storage/display system. I might be going about this backwards, but then perhaps its because I have little need for viewing my photos with my phone (Android) – although I do have the Google Photos app on my phone and iPad – and all photos are backed up via Google Drive. I understand Google Photos has as its priority user the cell phone photographer and those that take literally thousands of photos. I rarely take a photo with my cell phone. All that said, I take photos with a camera, and upload them to my PC where I edit, organize, delete bad ones, etc., with Picasa and then upload to Google Photos only the best ones with captions – putting them in “collections” albums. Those viewing my photos typically view them as I do on a PC. – The arrow key advances to the next photo when clicked and the next photos caption will be displayed with the photo. – Alternatively you can use arrow key on opposite side of photo and go back to previous photo and will have that caption displayed. It works well – but a real pain to have to give viewers of my photos these instructions so they can see the captions. Evelyn, I agree with everything you said! Just one comment: Using Picasa to upload albums w/captions to Google Photos (that’s the way I do it also) means that you do have all your best pictures in Google Photos. I would encourage you to think about using your Android phone and iPad more for showing your pictures to others – especially the iPad with the nice big viewing screen. I just think it is so cool to be in a conversation with a friend about some event in my past and in seconds I am able to pull out my phone (or iPad) and show them pictures of that event. OK … maybe it’s annoying to my friends 🙂 but I think it’s cool. Yep – its kind of annoying. I find it annoying when someone constantly tapping at their phone, bringing up photos, or websites, or who knows what – especially at restaurants. I’ve been at restaurants with small group and every head is in their phone – I prefer a regular conversation. Just to add perhaps of interest to readers – for viewing my photos with captions on iPad I highly recommend the $1.99 app from Pixite – “Web Albums” – displays beautifully the google photos “collections” with the captions I created in Picasa and uploaded. There is also an iPhone version. I use the ipad version – set the ipad upright as an easel, and can show my photos as a slide show with music background. I’m not selling the app, and have no connection to it – I just really like it, and found it to be a good $2 investment. That sounds Fabulous. Thanks Evelyn! Especially the part about linking to multiple Google accounts. I’m going to get it. Good stuff Bonnie – Thanks! Even more essential than captions is for Google to fix the problem that not all Picasa Web Albums are visible in Google Photos. This has been noted by many people on the Google Photos Product Forum but Google has taken no action nor have they changed their description that states all Picasa Web Albums are visible in Photos. I have 1500 Picasa Web Albums and only 500 show up in PHOTOS Collections Albums. There needs to be better integration between Picasa and PHOTOS which are two excellent products. Not all effort should go to mobile because there is a real place for desktops especially in photography. Where do you find the count of albums seen in Google Photos? I can see that I have 349 albums when I’m on PicasaWeb.Google.com, but I can’t find any similar count using Google Photos. It does appear that there are fewer albums showing in Google Photos. For example, in scrolling thru I do not see an album of mine named “France 2001” but … when I search for “France 2001” – lo and behold, it appears. Might it be possible that your albums are there – if you search for them? I agree that it is essential to see the captions in Google Photos. I opened a photo, clicked on Description but do not see where I can access ‘Send Feedback’. What am I doing wrong? You get to Feedback by the main Google Photos menu – the 3 lines at the upper left. Click on that and you should see Send Feedback as one of the listed options. Thank you for explaining all this, I find it really useful. I’m going to e-mail my opinion soon as well. After reading the article & also the comments, it has made me realise that I really need to work on adding captions more.